So you have a guitar now. Congratulations! Welcome to the club. I hope you go the guitar that you actually always wanted. Does it have the screaming powerful color that makes you feel like the center of attention? Awesome. Does it sound like the thunder and screams of a thousand skies splitting open and a thousand cries for more power? Good. Now the only thing left to do is to accessorize. You might think that you don’t need to, but buddy, my son (or daughter, just using the slang) you have never been more wrong in your life. You need every single one of the accessories, not because you want sound good enough as it is (because, if you are a beginner, you won’t sound good with the accessories too), but because these items will help you keep the guitar in tact for a whole while, sound good and even give you chance to explore sound like you have never imagined possible before. Are you excited? You should be, because you are about to have a whole lot of more fun buying some new stuff for your guitar. So first and foremost you need to identify what you are going for. I mean it is all dandy if you just buy up the accessories randomly and use them as per your wishes, but it might just be better if the accessories you got followed a singular vein you picked. So if you are going for a metal set up, maybe keep all of your accessories relevant to the genre. Or if you are going for a classic rock vibe, let’s keep things vintage, maybe? Whatever it is, you need to choose the vibe you are going for. Or don’t. It’s not like I am your father, mother, uncle or in any way related to you. You can choose your path, I will just suggest how to go about being better. The second thing you need to do, is understand what each of the possible accessories are, what they do and whether you need them or not. Being the nice guy that I am, I have compiled a short (read: long) list of all of the items you want to know about and included them in this post. I know I am a lovely person, don’t worry about it. Also before you start buying everything ever, make sure your parents are ok with it, if you need to that is. If you have a job and your own money, as well as an apartment, I envy you, person who has their life together. You also don’t need to ask your parents for money to help you buy all of the accessories ever. 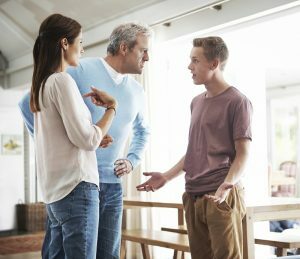 If on the other hand you are a broke and living with your parents, or worse, a teenager, make sure they are ok with helping you out a bit. You don’t want to be like the guy below, being screamed at after you dad or your mom see their credit card bill for the month. Now, into the thick of it all. I tried to list the items most important to least important, but to each their own, you know? The very first time you buy a guitar, you don’t realize how easy it is to damage your guitar in a way that you will forever regret. Depending on what the guitar is made of, of course, but still even the toughest tonewoods have a tough time staying dentless and scratchless if you don’t take care of them. Which is why getting a case for your guitar is so important. A proper case can protect your guitar no matter whether the guitar is stored up on top of the wardrobe, down in the cellar or in some storage unit for more years than you can count. Even if the guitar is on the road for many days out of the week, the case is there to protect it from the bumps and pits in the road. 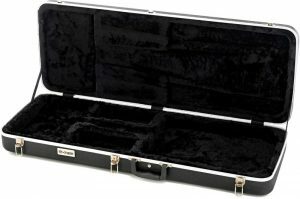 The problem with cases is that most of them tend to be on the more expensive side than most guitar players are comfortable with. The good thing about guitar cases is that they pay their worth in the years to come without a single issue. So it is highly recommended, from me, that you get one. It will allow your guitar to be your guitar for many years to come, seemingly in mint condition, so that many years down the road, when you take a look at it, you will get the feeling that you are as young as your guitar seems to be. The thing is, guitar cases are exceptional accessories for the purpose of storing your guitar, whether for transportation or for safe keeping. They are not that good when you try to transport your guitar on your back, for a short trip. I mean it is possible, but there is a better way to do it, called a gig bag. Unless you get a soft case, which is just a glorified gig bag. I think. Anyway, let me tell you about gig bags. Now that you have heard of the virtues of guitar cases, hard or soft, let me tell you about the virtues of guitar gig bags, the creatures that make living and going places with a guitar so much easier. Well, not really creatures, more like items, but you get the sentiment. The gig bag is what will make your life walking about with the guitar on your back so much easier, you will thank it every day. If you have band practice that is away from home, or gig to attend to, or anything that required you to carry your guitar more than 50 meters, a gig bag will be the handiest tool you will have ever bought. Gig bags are containers that allow you to store your guitar inside them and then carry them around without an issue. Usually gig bags are soft and light, to make carrying your instrument that much easier easier. They have straps to throw the gig bag over your shoulder. They contain a soft layer of protection that will defend your guitars from most kinds of hazards encountered on the road towards success and happiness. There is a large variety of gig bags available on the market today, some of them more expensive than others, and all of them designed to fit somebody’s taste. Black, white (don’t get white, they dirty too easily) and everything in between is available. They also come with differing amounts of pockets and protection. The more expensive a gig bag is, the more likely it is to have all kinds of extra features. Though the best gig bags don’t need to be expensive to be great. You can get a great gig bag with pockets for all of your other accessories for not too much money, so be excited! A gig bag might even be a good option if you don’t want to pick up an expensive guitar case. Just remember, this is a short term solution. Eventually you will want to get a case, so that your guitar can have better protection. Now that we have bagged the guitars we have bought, let us talk about one of the most important things that an electric guitar needs to have, even before the gig bag and the case. Yes, I lied to you, the gig bag and case are not the most important things and the accessories are not ordered in terms of importance. More like what I think you need to think about buying first, because you probably already thought about buying pick ups when you decided to buy an electric guitar. If not, you have poor planning skills and you need to get better at them, because life is only going to get only harder in terms of planning and if your electric does not have pickups, you got deceived. Anyway, your guitar probably does have its pickups, but you either got tired of them, they went flat or maybe you just wanted something other than what came with your guitar. Whatever it is, pickups are an incredibly wide subject that deserve their own individual post (we have two blog posts and a guide to help you pick out the best pickups we could think of). The first thing you need to know when you try to buy your pickups is what sound you are looking for, how many you are looking to buy, and whether you guitar is compatible with whatever you are picking up (HA!). Humbuckers, single coils, split coils, vintage pickups and a whole slew of other options need to be considered before you actually buy pickups. And while all of it might seem a little intimidating, choosing the right pickups will result in a great sound for your guitar that you will always enjoy. If you just bought the guitar, you probably don’t need to consider pickups yet. Still, it is important to think of the future, so take a gander at the whole catalogue of articles we have produced about pickups over the years. Now, let’s get down to the grimy, boring, unexciting details of owning a guitar. Because most of these things are a problem with guitar cables. Why? Because if somebody gets as excited about guitar cables as I do about everything guitar related, they have issues. And yes that is me admitting to the fact that I might have some issues (Read: A lot). 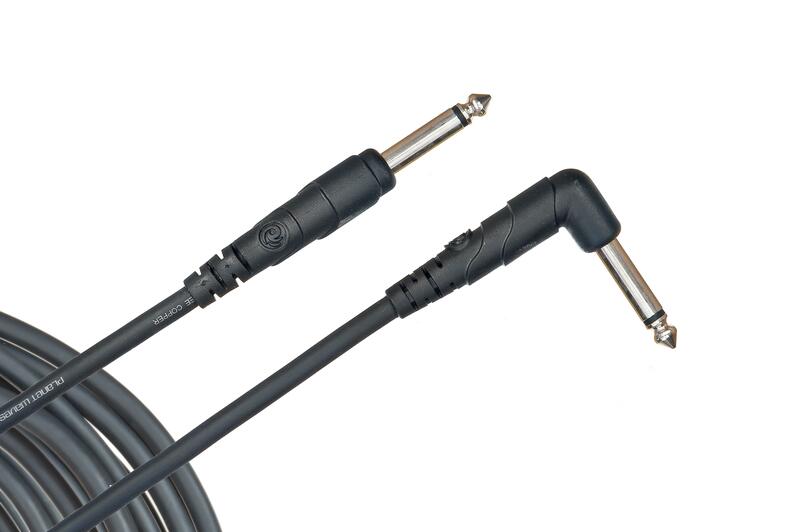 The thing with guitar cables is that, while a whole lot of guitar players don’t think about them, they are some of the most important details about the guitar. I mean these are the things that allow the sound to travel from the guitar to the gosh darned amp. The better the cable is, the cleaner and better the sound you make will be. I mean come on, it’s only logical. The rate at which the cables get broken is a lot higher than anyone wants it to be. The times when the cables get broken are the most unfortunate, to say the least (If you have ever tried gigging without a backup cable, you know what I am talking about). Which is why it is so important to pick your guitar cables right, and pick more than one. Thankfully I have your back and so do my colleagues, all of us who have been reviewing and working with guitar cables for a while now. Some of the best guitar cables cost no more than 20 bucks, and last for a whole while, while also coming as part of a set of two or three. So, if you are smart, you will go and pick up some of these guitar cables, and then pick up some more just in case, because you learned on the mistakes of others and decided to keep yourself safe from harm. If you have ever fantasized about playing a guitar, especially an electric one, than you probably have a very defined image in your head. It involves a set of shaggy hair, whirling in the air as you shake it together with the beat, your slender figure standing in the mix of darkness and smoke, center stage, as thousands of people scream out towards you, happily sponging up your guitar solo. The key word in all of this being, of course, standing, because playing electric guitar while sitting down is not as cool as Eric Clapton has made it look over the years. I mean who wants to not run around and dance around while they play the guitar with their band right? Which is why you need to immediately start considering what type of strap you want for your guitar. You need to consider several things, even if it feels like there isn’t much variety in terms of what kind of strap you want to get. The first thing is the material you want in your strap. Some straps are a little stronger than others, while also being a little more expensive. The next thing you need to consider is what kind of design you want for your strap. Whether it is the most colorful rainbow theme, tribal theme, or something much less cheerful, is up to you. There is a whole lot of combinations out in the world, with all of them offering things that you might find interesting. Whatever the combination you might be looking for, some of the best straps don’t have to be as expensive as you think for them to be as great as you want them to be. Whatever it is, find yourself one that feels close to your heart and to your soul, and prepare to rock all night long. 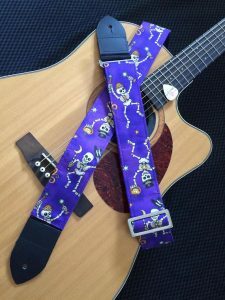 Speaking of guitar straps, another thing you need to keep your guitar wrapped around your shoulders is a couple of guitar strap locks that can withstand the pressure of dancing, jumping and other debauchery that you might participate in while playing. Guitar strap locks are an accessory that people don’t always give a whole lot of thought to. This is because the strap locks that come with the guitar you buy are usually sufficient for newbies and amateurs. Yet still, there is a whole dimension of the best strap locks out there, that might help the guitar feel more like its yours. Strap locks can vary in strength, depending on the material they are made of and the joints that are used in their construction. Another thing you might want to consider when buying a set of strap locks is the way they look. Because yes, there is a whole lot of variety available. The thing with strap locks is that they are not the most popular accessory to buy separately, and I do think this is one of the bigger mistakes. Buying a specific set of strap locks might guarantee that your guitar never falls to the ground, when you don’t want it to, and it also guarantees that your guitar will look the way you want it to. I imagine a whole lot of professional performers pick up their own strap locks, such as Jack White, Flea, Jimmy Page, so on and so on… So how are you any less ambitious to not buy every single detail of your guitar separately, especially the strap locks? 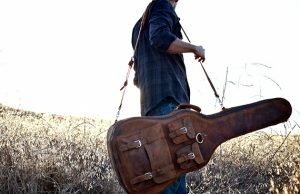 The thing that lets you carry the load of lead guitar for your band? Exactly, go take a look at some of the best ones, and pick one out for yourself. The devil is in the details they say, and even the tiniest of details can make a huge difference is what I say. While I might not go looking for the devil in guitar picks, I will go ahead and say that guitar picks are one of the most important parts of the guitar accessories you are going to own. And here we go again with me breaking promises about the list being in order of importance. I am not sorry, and neither should you be disappointed in me, because as I said, the list is in terms of importance of what you actually need to be looking at. That and how much sense the next item on the list makes in terms of the previous items on the list. Anyway, let’s get to talking about guitar picks and why you need to start caring about them, if you don’t already. You see guitar picks are not just tiny pieces of plastic that all have the same effect on the guitar. Some picks have very different effects from others, and all of them are made differently in terms of thickness, materials and even flexibility. Each of the aspects has a different effect on the sound you are going to be making with your instrument. The best picks have very specific purposes and are usually very expensive (as much as a pick can be). On the other hand there are some great picks that are not expensive, but still produce great results. Whatever it is, we have discussed all of them, both in terms of details and in terms of price, so go ahead and take a look. Don’t just pick according to what the pick looks like though. Definitely consider the sound you want to be making, relative to what of and how the pick is made. Just don’t end up buying something illegal. Nobody wants you to get arrested. So maybe you feel like you have covered the basics, and now you don’t need to get all of the rest of the stuff I am going to tell you about? Hey you are not necessarily wrong. I mean who needs all of the accessories that turn out to be useful at the times when you least expect them to? What use do you have for something like a capo, something that only acoustic guitar players will need when changing the key of the song to either accommodate the abilities of the vocalist or just play around with the sound of the song, right? I mean, it is entirely up to you whether you consider buying all of this stuff. I am just strongly suggestion that you buy all of it. Why? Because I know how important all of it is. Because one day you will realize that you do actually need a capo, for the very reason that acoustic guitar players are getting it. And when you do, you will regret not having it. Because the rest of your band is just like you and they didn’t pick up any for themselves either. Now that your life has become regret, you will think back on this moment and shake your fist at me from a thousand miles away for not being more insistent. Anyway, if you are already considering buying one, good stuff. There are many types of capos, all of them useful for relatively different purposes, but all of them serving the same end purpose. The best capos will have no problem serving you right or many years, while also not being the most expensive. They are offered in many styles and many shapes, so take your time learning about and working with them, until you figure out what your favorite might be. If you are buying into the rock and roll genre, I know the sound you think you will be making. I know the heavy rock and roll, the incessant wailing of the guitar, the riffs that could knock the pants off of every person inside the dome that you imagine yourself playing. I know how you think you will be doing it, but I also know something you don’t know. You will be needing a guitar slide for that. If you are buying into the country music world, I know that you will be needing the very same accessory for so many of the songs. Finally, if you are buying a slide guitar, or a resonator, or any guitar in the world really, and you want to produce a very specific, characteristic sound, I know that you need a guitar slide. Why? Because guitar slides are much more prevalent than you think in the modern world of music. They allow musicians to play around with the tones, jumping from one side of the tones to the other, while presenting those in the middle with ease. The slides allow for a metallic, sustain heavy sound, to fill the ears and hearts of the people. Which is what you need your guitar slide for. Now you might not agree with me and that is fine, but when you finally do, here is a thing you need to know. There is a myriad of substances that guitar slides are made from, starting from glass and ranging into metals, carbon fibers, and even plastics. The size variety is also important and a whole lot of other things that I am not in the mood to write about. The best slides are not that expensive and they are all worth buying. So maybe you should (read: you should definitely) consider buying a guitar slide. 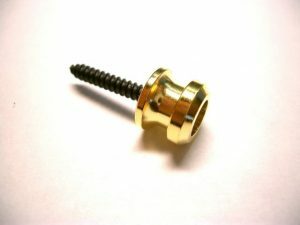 Now we are going to get to the less active, but no less important accessories for a guitar. 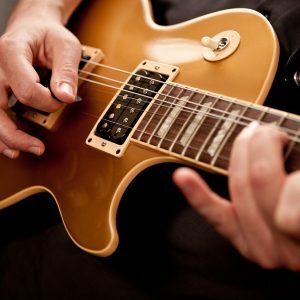 See, while there is a whole bunch of guitar accessories that you might end up using every time you play or perform, there is also a set of accessories that you will use on an almost daily basis, without ever directly involving the accessories into your playing, carrying or otherwise interacting with the guitar. I mean, I know that I already talked about the case and the gig bag, but these are more involved with you and the guitar interacting, and are present almost every time you perform or go somewhere with your guitar. The guitar stand on the other hand is only involved when your guitar is passive, but you want to keep it handy and on display. Which is why it is important to pick up a guitar stand that fits your guitar and your taste perfectly. Buying cheap will result in the guitar stand failing and your guitar ending up on the ground with some unfavorable dents and scratches. 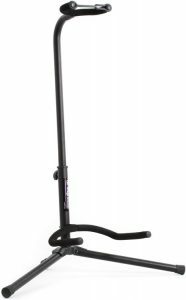 Buying the best guitar stands available (whether you are buying one or many) will result in your guitar being both safe and always on display. Which is why you need to consider what materials your guitar stand is made of. Are they sturdy, do they look good, do they last for a long time? Then you need to start considering the shape, how big or how small, how visible or invisible, and so on and so on the stands are. 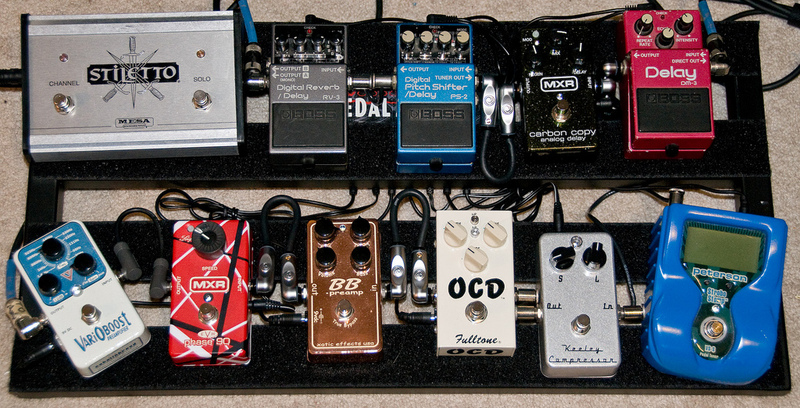 In the end it is your guitar that depends on these with the entirety of its being. So you better be on the not stingy side when trying to pick out the correct guitar stand for yourself. You might eventually even buy more than one, because your guitar collection is growing and you want to keep them on display. Just don’t forget to clean and maintain your guitar if you leave them on display with your stand. 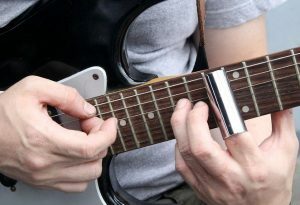 After many years of practice and after many years of work, every guitar player learns how to tune their guitars simply using their own ears and their knowledge of what music sounds like. Everybody else, including the professionals and sometimes even the people who know how to tune by ear, use a tuner. Why? 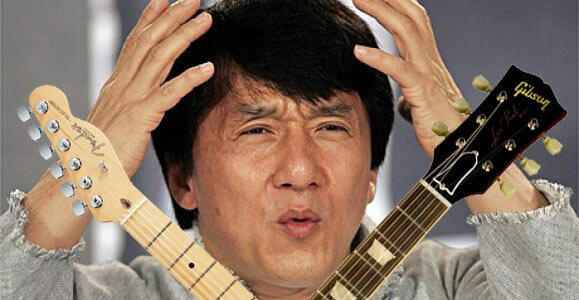 Because it is so incredibly hard and annoying to tune a guitar with having a reference points, or something to tell you if your guitar is in tune or not. Which is why it is so important to get yourself a tuner. You probably won’t end up using the tuner every day, maybe you’ll have to do it barely once a week, but it is incredibly useful when you do end up needing one. These tuners are the perfect little helpers when you need to tune your guitar quickly, without having to ask someone “does this sound right to you?”. The tuners are used by beginners and professionals alike, without anyone ever being embarrassed by it. And while there are online tuners to help you work around the problem of not having one, you don’t always have a good enough microphone or even the internet available to help you with the problem of an out of tune guitar. The best tuners last a lot longer than the worst, and all of them work on some kind of batteries. They are usually tiny, taking up barely any space and have visual and (some of them) even vocal assistance to help you tune your guitar. Most are easily attachable to your instrument, so that you can quickly and without the need for extra hands or surfaces, tune your guitar. This also allows your tuners to always be close at hand and easily available. These tiny little beasts are there to help you and barely cost anything, making them the perfect tiny accessory to have on you at all times. Whether you recently started practicing with your newly acquired guitar, or you are a seasoned musician with an intricate sense of rhythm and beat, it cannot hurt you to have something that will assist you when you are practicing or learning a new song, or composing one even. Which is why I am about to push the Metronome, one of the most useful and underestimated guitar accessories out there, as hard as possible. You see, for a beginner musician, it might be a little on the hard side to grasp the idea of a beat and keeping to it. It may be hard for them to learn a new song and to keep to the rhythm of the song. This is where the metronome comes in handy. It will assist the newly born musician in getting used to slow, fast and somewhere in the middle beats. It will help them achieve the discipline required to learn a new song to a painstakingly precise detail. It will help them, in the end, understand how music works. Simply by having the arrow swing from one side to the other. It’s not really called an arrow, but that is what I am going to describe it as to you, because it is easier that way. 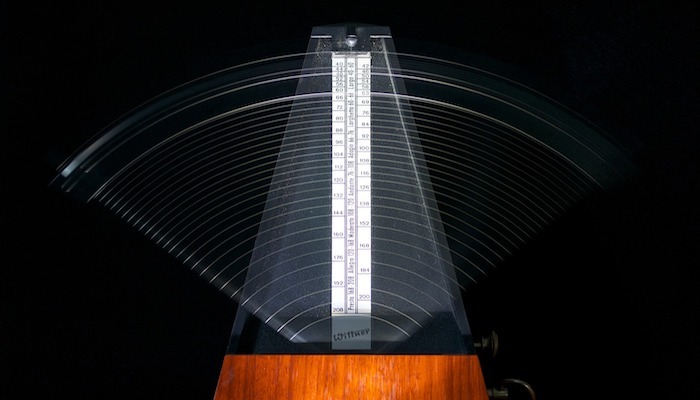 The metronome can be useful even to an advanced musician. Don’t believe me? Watch some of the greatest musicians of all time learn a new song or compose a new one. They usually have a metronome handy, so they don’t have to consciously keep measuring the beats and where their notes end up. The assistance received even helps them some of the best music to have ever existed. Which is why I think you need one too. The best metronomes are not just vintage things with swingy arrows, some of them are digital as well, and all of them can keep a beat without the issue of slowing down. Just take a look at the myriad available and you will see that the one that you feel like you want to own. That is the end of the list, thank god, is what you are thinking right now. Well, you are right. Congratulations, you got through it and maybe learned something useful as you were getting through it. Now the only thing left for you to do is go and pick up some of these items. The best of them will cost you a whole lot, while the worst of them will not work well enough for you. Which is why I am recommending you take your time picking the accessories, making sure you don’t already have some of them and are simply buying surplus for no reason. Also, as I said once already, remember to buy the things that fit your style and fit how you want to present yourself on the stage. 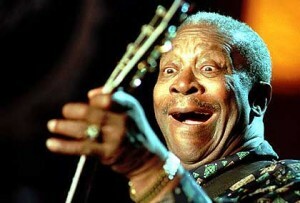 After all being a guitar player in a band is just as much being a public figure as it is performing good music. An unfortunate fact, but one we all have to deal with eventually. I remember the first time I realized I had acquired anything I would have ever needed for my guitar. It is a strange feeling and comes with a realization that you might just be a musician now. Except later that day I realized that I had been playing the guitar for only what can be about a year and a half and barely know how to be good at it. Took me a few years to catch up to the level of skill required to employ all of the items listed above to their full potential. Even then I found most of them useful way before I could ever understand why I needed a medium thickness pick instead of an incredibly thin one. So if you are currently looking at these accessories and wondering when you will ever use them, have faith. If you intend to pursue music you will eventually end up using the stuff. And you will be thankful that it is readily available to you. So while you might look like Jackie for now, you will eventually be savvy enough. So, all I have to say now is be smart in how you buy and what you buy. I mean if you are a beginner you will not be buying replacement pickups for a while, so don’t worry about it too much. But keep in mind that you might someday know that a certain pickup fits your musical taste better than what came with your guitar. Make sure you buy the basics first though. Good Luck and remember always have fun with your instrument!